Ask Pat Geraghty about his top takeaways from his third year at the annual meeting of the World Economic Forum, and he leads with a point not about the impact of artificial intelligence or universal coverage, but gender equality in the workplace. As you’ll hear in our GuideWell Insights interview with GuideWell’s CEO, AI and universal coverage are critical topics Pat looks to advance within and beyond our enterprise. But when 70 percent of GuideWell’s employees are women, Pat indicated his most practical takeaway from Davos was understanding how pervasive gender bias at work can be. What makes Pat committed to universal health coverage, but against a single payer system. For your convenience, the full transcript of the video is included below. You can also access the interview as a podcast on iTunes. 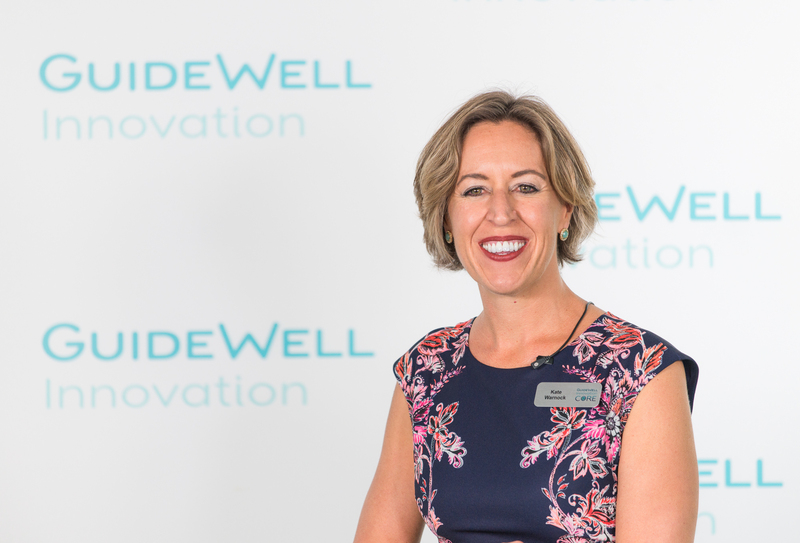 Find more Guidewell Insights where we ask industry leaders to share their thoughts on consumerism, innovation and market forces that continuously shape health care opportunities. - Hi, everyone, this is Kate Warnock, GuideWell social media manager, and I have here with me today Mr. Pat Geraghty. Pat, welcome. - Thank you, Kate, always good to be with you. - Happy to have you. So Pat, we're going to be talking to you about your experience at Davos, which is really the annual meeting of the World Economic Forum, and you and I had a chance to chat a little bit before, where you were telling me you had a practical takeaway. And I was hoping you could share with our audience what that practical takeaway was because I think some people might be surprised by what you found. - Well, I think the one that I referenced with you is that I went to this program on gender diversity, and interesting that when I walked in the room, there were 200 seats, and I was one of the first people in the room. And then I watched as the seats filled in, and it was me and one other guy and 198 women that were in this particular session. So, the program was really about how men and women interact in the workplace, and it was very informative. The first example that was given was by a gentleman who runs an orchestra. Actually, the orchestra is in Afghanistan, which is fascinating, and it's an all-female orchestra. But he was giving examples from orchestras around the world, and his example was, most orchestras are composed of 5% women, 95% men. But when they started to do auditions behind a curtain, the number of women in the orchestra went up to about 40%. So once you took the bias out of the interview process, it dramatically changed who was making the orchestra. And this is with orchestra leaders who thought they had no bias at all. So I find that very instructive to all of us. I think it sends a message about, you may have bias even when you don't think you have bias. And I think the conversation then went on to have other women on the panel talk about things that they encountered in the workplace, like he-talking, which is a man over-talking a woman and a woman finding it very difficult to get into the conversation. Or in some conversations where a woman leads with an idea, it sort of gets sidetracked, and then some guy comes back in later in the conversation and claims the credit for the idea as they reintroduce it. So I brought those two examples back here to GuideWell, talked to my team about it, talked to the leadership team about it so that we're all more sensitive to thinking about the practical implications of how that plays out in the workplace. 'Cause after all, we have almost 70% women who work here at GuideWell, and I think we want to make sure that we're getting the full contribution of everyone who comes to work here, and I think it's a great reminder to all of us that we can only reach our potential if we're a fair and open environment. - Terrific. Okay, well Pat, I know that you also had the opportunity. You were invited by Dr. Farrugia, who is the CEO of Mayo Clinic here in Jacksonville, to a breakfast panel, and had some other illustrious members on it. The topic was about disruption and innovation, I believe, in the health industry. Tell us about that experience. - Yeah, very specifically, it was about transformation and how to transform your organization. So, Dr. Farrugia, who's a good friend, asked three people to be the discussion leaders at the breakfast. He asked for me to tell the GuideWell story. He asked for the head of Royal Dutch to tell their story about how they entered the health device field. And then the gentleman from Proteus, asked him to talk about how a disruptor in digital health comes into the workplace. So we each got to tell our story, and it was kind of nice to be able to tell the GuideWell story on an international stage. Obviously, a lot of people pay attention when we double the company, literally went from an eight-billion-dollar company six years ago to finishing last year over 16-billion. Most times a company that's that mature does not double in the timeframe that we did. So lots of different things, obviously, that happened here. - I know that, Pat, in talking about Davos, we have these global leaders from around the world, and we all have our issues with health. And as you have said, health is global regardless of your politics. So in what ways are the leaders at Davos coming together to really try to make good and make transformation happen? - Yeah, well I think, Kate, you hit it in part of that question, and that is people who come to Davos come there to look at the power of companies and organizations that are government-related coming together with the intention of doing good in the world. So that's what I really like about Davos. It brings that level of energy and that level of commitment to start with. The next is, I think you start to see the things that are different and like around the world. So for instance, we've been struggling in our country with diabetes and obesity. Well, now we see that that's becoming more of a worldwide issue. It's been very much now on the map in Europe, and other parts of the world are starting to see those issues and challenges, so it's becoming much more of a global focus around wellness, nutrition, how to keep people healthy in the first place. Those are common themes now at Davos. It used to be the common theme to think about epidemic. Well, that is still a theme, but it isn't the only theme, as these other issues have gotten on the stage, the epidemic issue is very clear. So it's very important that all of us think about how to prevent it in the first place, how to get at it at its source, and then, certainly, immunizations is a critical issue. Bill Gates has been at Davos each year, really spearheading an issue around immunizations. So those are the kinds of things that get a really high level of attention in Davos. I think the other thing I heard more of this year was about the disparity of wealth between a variety of people, obviously, in the world, and how do we deal with that? How do we deal with the social determinants of health? That are really critical issues that you see that the disparity of wealth exacerbates on a global basis. So those were the kinds of subjects that were getting lots of attention. - Okay, well Pat, another thing that I'm sure got a lot of attention, it's all over in media, is artificial intelligence. And I know that you sat in a couple sessions and had some real solid takeaways that maybe make you think differently about how GuideWell might approach AI. Can you give us some details on that? - Well, I think there's tremendous potential in AI and I think there's a lot to be concerned about. And so anything we do in the AI space has to be with our eyes wide open. Clearly, there's many, many developments that have taken place that have taken data and intelligence that systems have and are starting to take where machines can learn at a rapid pace, better than any of us could learn. They can absorb all kinds of information and bring that information back. But that information, without human touch in some critical decision-making, can be dangerous at points in time. So I think we have to guard against that. We also have to look for privacy, and how do we protect people's privacy? As all of this data continues to emerge and gives us all kinds of information about individuals. So I think that the balance of moving technology so we can all be more efficient, we can make better decisions, but balancing it against the human impact and the risks involved, we're really getting a lot of attention, and I think those are the kinds of things that we need to struggle through and not just blindly say yes, let's move AI without any borders or any governors around how fast it moves. I think that all of that discussion around the privacy concerns and other kinds of implications for people have to be very, very carefully weighed as we go down that pathway. - Okay. Pat, a final topic for you today. I'm not really sure how much conversation that's had at Davos, but it's certainly a persistent theme here in the United States, and that's around universal coverage and single-payer. And I think that there might be some confusion in the market that those are one and the same. You've had experience at Davos hearing from ministers of health of single-payer nations that might give people pause if they understood the challenges with that. So can you kind of go in to a little bit more detail for us. What should people really know about single-payer and universal health coverage? - Well, first of all, thanks for the question, Kate. You know, they're certainly not the same, one and the same. So universal health is everyone being covered. And single-payer is one entity administering the program. Universal health we are on board for. Clearly, something we care greatly about through the Affordable Care Act and other things. We've been an advocate for more people being covered and hopefully, everyone being covered at some point in time in our country. We certainly have the funds in our nation to do it. We have the means to do it, and we haven't yet gotten there, but I think we can get that done. Around the world, when you look at health systems, many Americans think everybody else is in a single-payer system, and they're not. There are all kinds of varieties of systems that are out there. But for the most part, most systems have a national system and then a private system wrapped around it. People with means tend to buy their way out of the national system. And so it's a misnomer to think that there's just one way of doing this around the globe. We also heard from folks from the national health system in England and from various health systems around Europe that they're having many challenges. The obesity challenge I mentioned earlier. And the ability to process data and do things as efficiently and as effectively as they would like. They continue to have shortages of the ability to serve as many people as they'd like to serve. So in many nations, you wait depending upon where you are on the list for a particular service. I don't think Americans are ready for that. We're not used to being on a list and being told "We can't get to you this year, you're gonna have to wait." So I think we take the private system that we have, continue to evolve it and figure out how to be more efficient, how to use technology to help the system be better. But if you even look to Canada, if you have a complex medical condition in Canada, many of those people are coming to the Mayo Clinic, the Cleveland Clinic, the University of Buffalo Medical Center, right across our northern border, we're serving lots of Canadians. So the issue for us is we don't have a place to go, necessarily, from the United States. We've got to serve our own folks. And we want and expect the very highest quality of care, which you obviously can get here in the United States. Our challenge is how to do it more efficiently, how to do it more effectively, and how to cover everyone in the country. I think we can take that challenge on, but I don't think the silver bullet that some people think of a single-payer is the way to do it. As a matter of fact, we need competition, not only on the health plan side, actually, on the delivery side. Competition on the delivery side brings the cost down for everyone. So some people might say, well, what about an isolated facility, or those who are in places where there aren't a lot of options? And I say to you, technology is going to bring competition everywhere, because with the dawn of the ability to get mobile healthcare, you'll have an option of seeing healthcare right there in your town or getting healthcare from someone telephonically or through some other device, and that will be a choice for you. And I think those choices are gonna be good for people. - I think that's the perfect point to end on, Pat. So thank you for sharing your time with us, and glad that you had the stage time that you did at the World Economic Forum. Hopefully, we'll get to catch up with you again when you do it next year. - Thanks, Kate, my pleasure. - Alright, thank you so much. This is Kate Warnock, thanks for watching.